Discussion in 'Road & Cyclocross' started by furiousd, Sep 1, 2018. OKTOBERFEST ISN’T OVER UNTIL WE SAY IT’S OVER. There will be RACING. There will be FOOD. There will be BEER! The Stoudts Brewing Co. / JB’s Bike Shop Racing Team is back with their annual brewery-side "November Classic" PACX Series race at Stoudts Brewing Company in Adamstown, PA! 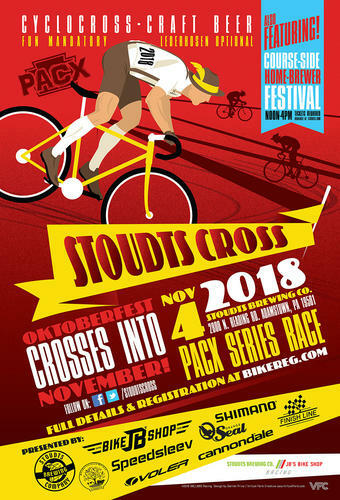 This year is the seventh anniversary of the family friendly, cyclocross racing event on the grounds of Stoudts Brewing Company that features a full day of racing, fantastic German food and, of course, award-winning craft beer by Stoudts to keep the Oktoberfest celebration rolling right into November! Spectating is FREE and food & beer will be available throughout the day for purchase in the Beer Garden. Stoudts’ will also be pouring course-side at the outdoor beergarden! The Wonderful Good Market will have coffee, baked goods—as well as their famous soft pretzels—and more available out back where the race action is taking place. Additionally, from noon-4PM Stoudts will be hosting a Home Brewer’s Festival just a few steps from the course. Additional details and tickets for this event can be found at Stoudts.com.